"No place back home: A year after Harvey, Rockport can't house all its displaced residents" was first published by The Texas Tribune, a nonprofit, nonpartisan media organization that informs Texans — and engages with them — about public policy, politics, government and statewide issues. 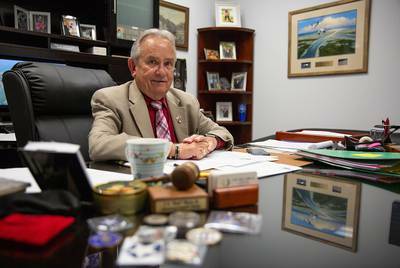 ROCKPORT — Since all that’s left of the old Aransas County Courthouse is a pile of rubble and a slab of concrete, these days County Judge Burt Mills holds office in a strip mall storefront, flanked by a Chinese buffet and a boutique. “It’s very nice, actually,” Mills said last week from his office in what used to be a hardware store. This 23,000-square-foot building, hastily renovated after Hurricane Harvey into a temporary courthouse in 45 days, is a testament to the region’s remarkably speedy recovery, Mills said — and a reminder, one year later, of just how much is left to do. Here, under the retail-store fluorescent lighting, county officials ponder the future of Mills’ coastal hometown, nestled 30 miles northeast of Corpus Christi and separated from the Gulf of Mexico by a thin strip of barrier island. Top of mind: how to pay for the extensive damage to businesses, homes and public buildings from Harvey’s 130-mph winds and how to bring the thousands of people displaced by the storm back home. Though officials in this solidly Republican county bristle at the mention of human-induced climate change, the economic and environmental risks posed by sea level rise and worsening hurricane intensity linger like a not-so-distant storm cloud over locals’ best-laid plans for long-term recovery. Nobody knows exactly how many of Rockport’s roughly 10,000 residents left after Harvey blasted through here as a Category 4 storm on Aug. 25, 2017, but a loose consensus among local officials is that population is down about 20 percent. According to the Aransas County Independent School District, student enrollment fell about 15 percent after the hurricane, and Mills estimates the county lost about one-quarter of its taxable property. Anita Phillips grew up on the Atlantic coast of Florida but lived in Rockport for more than 25 years until Harvey arrived. A 47-year-old single mother raising three children, she said she still considers the bayfront community home. If only she could still afford to live there. Phillips and her kids were living in a three-bedroom townhome just off of Rockport’s main thoroughfare when Harvey hit. Leaving behind most of their possessions, they hurriedly evacuated a day before landfall, fleeing up Interstate 37 to the San Antonio area, about 160 miles inland. One daughter, Alyssa, then 15, stayed with relatives, while Phillips and her other children, 12-year-old Jasmine and 5-year-old Malachi, rented a FEMA-funded hotel room for about six months. The Rockport townhome, which Phillips rented for about $1,000 per month, was ruined, along with all of the belongings they left behind. Phillips’ older daughter enrolled at a school in nearby Floresville to finish the academic year, while her two younger children missed out on half a year’s worth of instruction. Without a place to keep the family dog, Bowser, a heartbroken Phillips explained to her children they would have to send him away. Recently, Phillips paid a visit to the gutted building, where missing sheetrock revealed bare wooden framing. It was mostly barren, but when Phillips found her son’s old bath toy, a rubber dog floating on an inner tube, in an upstairs bathroom, her eyes welled with tears. “You can never go home again — you really can’t,” she said over the sound of someone hammering outside. 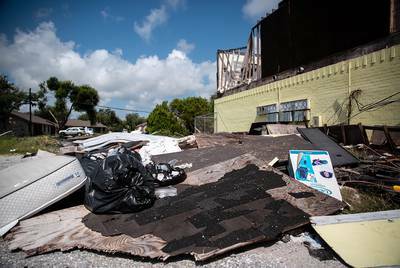 In June, the Texas General Land Office awarded $6.5 million in federal recovery money to help rebuild two damaged Rockport apartment complexes, but it’s unclear when the nearly 100 units will be completed. At the site of the ruined Oak Harbor apartments, construction work has yet to begin. Windows remain boarded up, while a pile of shingles fallen from the units’ mansard-style roof bakes in the summer sun alongside ruined mattresses and faded pink insulation. A mile away, in the historic downtown neighborhood, empty lots pockmark the main street where entire buildings are missing except for their concrete front steps. But others, like the Rockport Daily Grind coffee shop, have been completely remodeled and were bustling with business during the waning days of the summer season. Diane Probst, president of the local chamber of commerce, said the area has been desperate to attract workers as hotels and local businesses have reopened. “Do we need to house them in Beeville” — about an hour away — “and bus ‘em over here?” she asked. Phillips said she’s not sure if she’ll take part in the celebrations, which are a 20-mile drive from where she’s living. When their hotel voucher expired, Phillips and her family relocated to the tiny town of Gregory. It was the nearest place she could afford. Phillips previously worked as a home health attendant, but since the storm she’s been out of a job. While she looks for possible retail work, driving a car loaned to her by a friend, Phillips’ only income comes in the form of a child-support check, she said. Her living situation in Gregory is far from ideal — the new landlord charges a prohibitively expensive pet rate, and the apartment complex has very little shade, making it difficult for her younger daughter, who has albinism, to go outside — but it’s enough to keep her children near the schools and community where they grew up. And it’s close enough for Phillips to visit her mother in a Corpus Christi nursing home. But the cost of living has kept her out of Rockport, and officials say hundreds of other displaced locals face similar circumstances. “Quite frankly, affordable housing is not here,” Mills, the county judge, said. Scientists see a clear link between Hurricane Harvey’s record-setting intensity and climate change. The tropical cyclone barreled ashore at Rockport, then weakened and meandered for days up the Texas coast, triggering the largest rainfall event ever recorded in the U.S. — dumping more than 60 inches on some areas. It left more than 90 people dead and caused about $125 billion worth of property damage in Texas. At least two studies have found that rising ocean temperatures likely increased Hurricane Harvey’s associated rainfall by a significant margin — anywhere from 13 to 37 percent. While wind damage, not rainfall, was the primary cause of destruction in Rockport and Port Aransas, storm surge — made worse by sea level rise — also had a significant impact on Rockport’s inland-facing subdivisions. Tiny Rockport has not been the focus of much academic study. But elsewhere along the Texas coast, scientists have painted a bleak picture for future natural disasters in an era of rapid sea level rise. After Galveston sustained devastating flooding from Hurricane Ike in 2008, scientists examined the risks posed by future storms. Researchers Hal Needham and Nick McIntyre modeled how a 40-block area of the city would fare under various flooding scenarios. If a 100-year flood event occurred in 2020, they predicted, it would inundate 59 percent of the area’s buildings. With projected sea level rise over time, that number would rise to 70 percent in 2050 and 99 percent in 2100. Hundred-year floods have become common on the Texas coast: Houston experienced what were considered 500-year floods for three consecutive years, including Harvey. Despite the growing risks of natural disaster, the number of Texans living in coastal counties has seen explosive growth over time. Texas’ share of the nation’s coastal population grew from 4.9 percent in 1960 to 6.7 percent in 2008, according to a U.S. Census Bureau study. From 2000 to 2016, coastline counties along the Gulf of Mexico grew by more than 3 million people, or 24.5 percent — led by Harris County, which includes Houston and added 1.2 million residents. But not all coastal communities have grown so rapidly. A decade after Hurricane Ike, Galveston’s population has yet to return to its pre-hurricane levels. The latest Census estimates put the island city at about 49,000 inhabitants, down from about 57,000 in 2000. As Rockport rebuilds its housing stock, Jack Chaney, an Aransas County commissioner, said he wants to see homes built to higher standards to withstand more violent storms — a move that could improve structural safety but likely would make housing more expensive at a time when Rockport’s low-income market is hurting. He still sees an optimistic future for the county, in which the local population will rebound, property values will rise and the county will be able to cut its property tax rate to help save the locals some money. “They’ll be back eventually,” Chaney said over a barbecue lunch at Stevie Lew’s. But he does worry about what the next storm will look like, given Harvey’s catastrophic effects on many neighborhoods. “I still can’t drive out to some of my precincts without crying,” he said. Some Rockport residents were displaced by the storm, but others were too poor to escape it. That’s how Franklin Rowe sees his situation, anyway. Rowe, 55, and his partner Lori Sanderson returned to Rockport three days after Harvey made landfall to find their trailer home in ruins: water soaked into the sheetrock, floorboards missing, the porch collapsed. The couple said they received about $4,000 from FEMA, which fixed the porch and paid for a rented ozone machine for the mold, with enough left over to have a fallen tree removed. Rowe said multiple contractors have quoted their damages at about $90,000, more than it would cost to buy a new trailer. So for the last year, Rowe has been living in the mold-infested home, using inhalers to deal with flare-ups from his chronic obstructive pulmonary disease. They plugged the holes in the wall of the bathroom with toilet paper. They covered the melon-sized opening in the living room floor with a wooden panel to keep the possums from getting in. In the meantime, they’re hoping a charitable donation will come in. “We call it a step above camping,” Rowe said. Editor's note: This story was reported in partnership with weather.com. No place back home: A year after Harvey, Rockport can't house all its displaced residents By Edgar Walters August 24, 2018 ROCKPORT — Since all that’s left of the old Aransas County Courthouse is a pile of rubble and a slab of concrete, these days County Judge Burt Mills holds office in a strip mall storefront, flanked by a Chinese buffet and a boutique. “It’s very nice, actually,” Mills said last week from his office in what used to be a hardware store. This 23,000-square-foot building, hastily renovated after Hurricane Harvey into a temporary courthouse in 45 days, is a testament to the region’s remarkably speedy recovery, Mills said — and a reminder, one year later, of just how much is left to do. Here, under the retail-store fluorescent lighting, county officials ponder the future of Mills’ coastal hometown, nestled 30 miles northeast of Corpus Christi and separated from the Gulf of Mexico by a thin strip of barrier island. Top of mind: how to pay for the extensive damage to businesses, homes and public buildings from Harvey’s 130-mph winds and how to bring the thousands of people displaced by the storm back home. Though officials in this solidly Republican county bristle at the mention of human-induced climate change, the economic and environmental risks posed by sea level rise and worsening hurricane intensity linger like a not-so-distant storm cloud over locals’ best-laid plans for long-term recovery. Nobody knows exactly how many of Rockport’s roughly 10,000 residents left after Harvey blasted through here as a Category 4 storm on Aug. 25, 2017, but a loose consensus among local officials is that population is down about 20 percent. According to the Aransas County Independent School District, student enrollment fell about 15 percent after the hurricane, and Mills estimates the county lost about one-quarter of its taxable property. Aransas County Judge C. H. "Burt" Mills sits in his office at the temporary county courthouse building, which was hastily remodeled after the storm. "It's very nice, actually," Mills said. Shelby Knowles for The Texas Tribune A survey released this week by the Kaiser Family and Episcopal Health foundations found that 62 percent of people in coastal areas hit by Harvey, including Aransas County, suffered damage to their homes, while 27 percent said someone in their household experienced job or income loss. Eight percent of the respondents said they haven’t been able to return home. But Mills is optimistic that the majority of the people who left won’t stay gone forever. “They’re gonna come back,” he said. “This is home. This is my little piece of paradise, and I believe everybody that lives in Aransas County feels that way.” But whether Rockport and the surrounding communities can make a complete rebound will depend on their ability to provide affordable housing for the lower-income workers displaced by the storm whose labor fuels the local tourism economy, and on their ability to withstand the rising tides and more extreme storms forecasted for a warming planet. ‘We want to go back home’ Anita Phillips grew up on the Atlantic coast of Florida but lived in Rockport for more than 25 years until Harvey arrived. A 47-year-old single mother raising three children, she said she still considers the bayfront community home. If only she could still afford to live there. Phillips and her kids were living in a three-bedroom townhome just off of Rockport’s main thoroughfare when Harvey hit. Leaving behind most of their possessions, they hurriedly evacuated a day before landfall, fleeing up Interstate 37 to the San Antonio area, about 160 miles inland. One daughter, Alyssa, then 15, stayed with relatives, while Phillips and her other children, 12-year-old Jasmine and 5-year-old Malachi, rented a FEMA-funded hotel room for about six months. The Rockport townhome, which Phillips rented for about $1,000 per month, was ruined, along with all of the belongings they left behind. Anita Phillips, 47, said she would like to return to Rockport if the rents weren't cost-prohibitive. "That's where our friends were and our family was, but a lot of people are no longer there," she said. 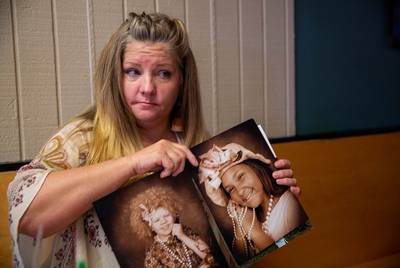 Shelby Knowles for The Texas Tribune Phillips’ older daughter enrolled at a school in nearby Floresville to finish the academic year, while her two younger children missed out on half a year’s worth of instruction. Without a place to keep the family dog, Bowser, a heartbroken Phillips explained to her children they would have to send him away. Recently, Phillips paid a visit to the gutted building, where missing sheetrock revealed bare wooden framing. It was mostly barren, but when Phillips found her son’s old bath toy, a rubber dog floating on an inner tube, in an upstairs bathroom, her eyes welled with tears. “You can never go home again — you really can’t,” she said over the sound of someone hammering outside. While pockets of new construction gradually sprout from dirt lots all over town, the scars left behind by Harvey are impossible to miss. In a working-class subdivision, vacant homes outnumber occupied ones. One abandoned trailer, covered with green and black spores, bears a dire warning spray-painted on its facade: “MOLD — DON’T ENTER.” In June, the Texas General Land Office awarded $6.5 million in federal recovery money to help rebuild two damaged Rockport apartment complexes, but it’s unclear when the nearly 100 units will be completed. At the site of the ruined Oak Harbor apartments, construction work has yet to begin. Windows remain boarded up, while a pile of shingles fallen from the units’ mansard-style roof bakes in the summer sun alongside ruined mattresses and faded pink insulation. A mile away, in the historic downtown neighborhood, empty lots pockmark the main street where entire buildings are missing except for their concrete front steps. But others, like the Rockport Daily Grind coffee shop, have been completely remodeled and were bustling with business during the waning days of the summer season. Diane Probst, president of the local chamber of commerce, said the area has been desperate to attract workers as hotels and local businesses have reopened. “Do we need to house them in Beeville” — about an hour away — “and bus ‘em over here?” she asked. The chamber says more than 80 percent of businesses have reopened in the year since the storm, some of them operating out of food trucks. To mark Harvey’s anniversary on Saturday, local officials have arranged for townsfolk to join in a downtown dance mob to the tune of “I Will Survive.” Phillips said she’s not sure if she’ll take part in the celebrations, which are a 20-mile drive from where she’s living. When their hotel voucher expired, Phillips and her family relocated to the tiny town of Gregory. It was the nearest place she could afford. “We want to go back home, all of us, because that’s where our friends were and our family was, but a lot of people are no longer there,” she said. “We’re still kind of in a limbo.” Phillips previously worked as a home health attendant, but since the storm she’s been out of a job. While she looks for possible retail work, driving a car loaned to her by a friend, Phillips’ only income comes in the form of a child-support check, she said. Her living situation in Gregory is far from ideal — the new landlord charges a prohibitively expensive pet rate, and the apartment complex has very little shade, making it difficult for her younger daughter, who has albinism, to go outside — but it’s enough to keep her children near the schools and community where they grew up. And it’s close enough for Phillips to visit her mother in a Corpus Christi nursing home. But the cost of living has kept her out of Rockport, and officials say hundreds of other displaced locals face similar circumstances. “Quite frankly, affordable housing is not here,” Mills, the county judge, said. Rockport business owners said they faced a labor shortage as apartments and affordable rentals have not been rebuilt after Harvey. Shelby Knowles for The Texas Tribune “[Low-wage workers] have moved on to bigger places like San Antonio or wherever, got jobs, got a place to live,” he said. “Maybe they’d like to come back to Rockport, but would they like to come back for a job that pays not as much as they’re making in San Antonio — and not have a house to live in?” Local business owners fear the situation could put a drag on the local economy as the tourism industry slows to a crawl at summer’s end. “My friends that own businesses in town are struggling, struggling, struggling to find employees,” said Stevie Lew Meinhausen, who owns a local barbecue restaurant. “The primary issue is they don’t have an affordable place to live.” The risks of coastal living Scientists see a clear link between Hurricane Harvey’s record-setting intensity and climate change. The tropical cyclone barreled ashore at Rockport, then weakened and meandered for days up the Texas coast, triggering the largest rainfall event ever recorded in the U.S. — dumping more than 60 inches on some areas. It left more than 90 people dead and caused about $125 billion worth of property damage in Texas. At least two studies have found that rising ocean temperatures likely increased Hurricane Harvey’s associated rainfall by a significant margin — anywhere from 13 to 37 percent. While wind damage, not rainfall, was the primary cause of destruction in Rockport and Port Aransas, storm surge — made worse by sea level rise — also had a significant impact on Rockport’s inland-facing subdivisions. “One of the more confident predictions we can make for hurricanes in the future is that they will dump more rain,” meteorologist Jeff Masters wrote in a June blog post for Weather Underground about Harvey’s historic rainfall. “Global warming increases the rate at which ocean water evaporates into the air, and increases the amount of water vapor the atmosphere contains when fully saturated.” Tiny Rockport has not been the focus of much academic study. But elsewhere along the Texas coast, scientists have painted a bleak picture for future natural disasters in an era of rapid sea level rise. After Galveston sustained devastating flooding from Hurricane Ike in 2008, scientists examined the risks posed by future storms. Researchers Hal Needham and Nick McIntyre modeled how a 40-block area of the city would fare under various flooding scenarios. If a 100-year flood event occurred in 2020, they predicted, it would inundate 59 percent of the area’s buildings. With projected sea level rise over time, that number would rise to 70 percent in 2050 and 99 percent in 2100. Hundred-year floods have become common on the Texas coast: Houston experienced what were considered 500-year floods for three consecutive years, including Harvey. Despite the growing risks of natural disaster, the number of Texans living in coastal counties has seen explosive growth over time. Texas’ share of the nation’s coastal population grew from 4.9 percent in 1960 to 6.7 percent in 2008, according to a U.S. Census Bureau study. From 2000 to 2016, coastline counties along the Gulf of Mexico grew by more than 3 million people, or 24.5 percent — led by Harris County, which includes Houston and added 1.2 million residents. But not all coastal communities have grown so rapidly. A decade after Hurricane Ike, Galveston’s population has yet to return to its pre-hurricane levels. The latest Census estimates put the island city at about 49,000 inhabitants, down from about 57,000 in 2000. 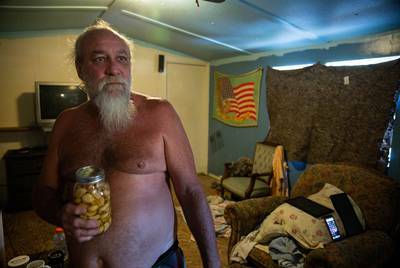 Franklin Rowe, 55, has lived with mold in his storm-damaged home for nearly a year. "Ain't got no money to go nowhere else," he said. Shelby Knowles for The Texas Tribune As Rockport rebuilds its housing stock, Jack Chaney, an Aransas County commissioner, said he wants to see homes built to higher standards to withstand more violent storms — a move that could improve structural safety but likely would make housing more expensive at a time when Rockport’s low-income market is hurting. Asked if the forecasts of worsening hurricane severity gave him pause, Chaney, a climate change skeptic, said: “Not really, because there’s nothing we can do about that.” He still sees an optimistic future for the county, in which the local population will rebound, property values will rise and the county will be able to cut its property tax rate to help save the locals some money. “They’ll be back eventually,” Chaney said over a barbecue lunch at Stevie Lew’s. But he does worry about what the next storm will look like, given Harvey’s catastrophic effects on many neighborhoods. “I still can’t drive out to some of my precincts without crying,” he said. Living amid the wreckage Some Rockport residents were displaced by the storm, but others were too poor to escape it. That’s how Franklin Rowe sees his situation, anyway. Rowe, 55, and his partner Lori Sanderson returned to Rockport three days after Harvey made landfall to find their trailer home in ruins: water soaked into the sheetrock, floorboards missing, the porch collapsed. The couple said they received about $4,000 from FEMA, which fixed the porch and paid for a rented ozone machine for the mold, with enough left over to have a fallen tree removed. Rowe said multiple contractors have quoted their damages at about $90,000, more than it would cost to buy a new trailer. So for the last year, Rowe has been living in the mold-infested home, using inhalers to deal with flare-ups from his chronic obstructive pulmonary disease. “Ain’t got no money to go nowhere else,” Rowe said. “Like my mother-in-law said, ‘Y’all can’t even afford the U-Haul to get out of town.’” They plugged the holes in the wall of the bathroom with toilet paper. They covered the melon-sized opening in the living room floor with a wooden panel to keep the possums from getting in. In the meantime, they’re hoping a charitable donation will come in. “We call it a step above camping,” Rowe said. Editor's note: This story was reported in partnership with weather.com. Join us at this upcoming Texas Tribune Event: The Federal Response to Harvey: One Year Later, Aug. 30, Houston Read related Tribune coverage Debt, loss and faith: How three families are faring a year after Hurricane Harvey After Harvey, questions remain about whether registry helped people with disabilities On Harvey's anniversary, Houstonians set to decide on historic flood control bond "No place back home: A year after Harvey, Rockport can't house all its displaced residents" was first published at by The Texas Tribune, a nonprofit, nonpartisan media organization that informs Texans — and engages with them — about public policy, politics, government and statewide issues. Link back to the original article, which is located at https://www.texastribune.org/2018/08/24/hurricane-harvey-year-later-rockport-cant-find-housing-evacuees/.